Always looking to support local, I’m proud to share this Purple Urchin review. They make amazing soaps but lately have been branching out, making more skincare options. I’ve tried so many products, I can’t even start listing them but more have failed than delivered. 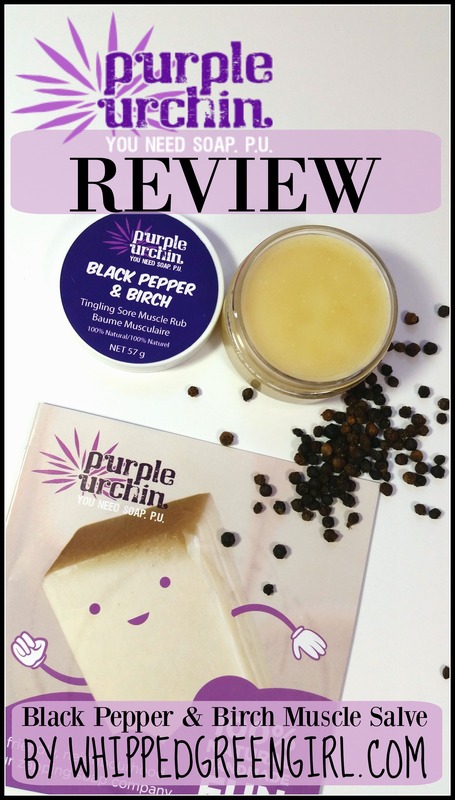 It’s always the pepper essential oil rubs that work best, so when I was shopping at my local organic grocer Rainbow Foods – I was excited to buy and try a new one: Purple Urchin Black Pepper & Birch muscle rub. For my first Purple Urchin review, I picked this rub cause it really helped my muscle pain personally. 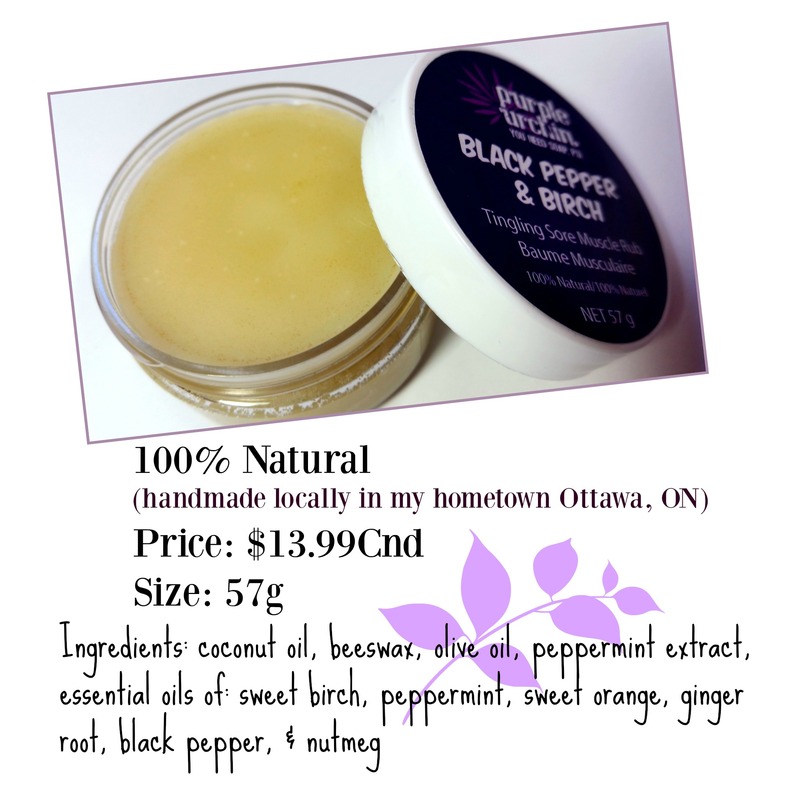 Packaged in a small round jar, the balm smells strong! Like strong fresh mint with warm spice. One sniff can clear your sinuses lol. I remember my grandfather constantly gooping on this blue gel junk called “Icy” I think as a child… It blasted my eyes- the permanent smell was intoxicating but he loved it for his muscles. 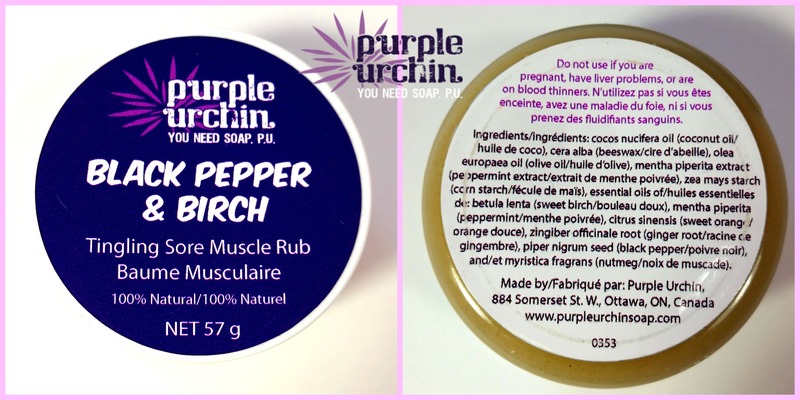 I sure wish I knew about this stuff back then to replace it- Purple Urchin’s Black Pepper and Birch muscle rub is the 100% healthy and better smelling version of “Icy”. Purple Urchin started-out making organic, environmentally friendly soaps. I’m stoked to see their line is growing with new star items like this muscle balm. It really helps settle my muscles after works-out, stressful days, or when I’m just generally feeling pain. 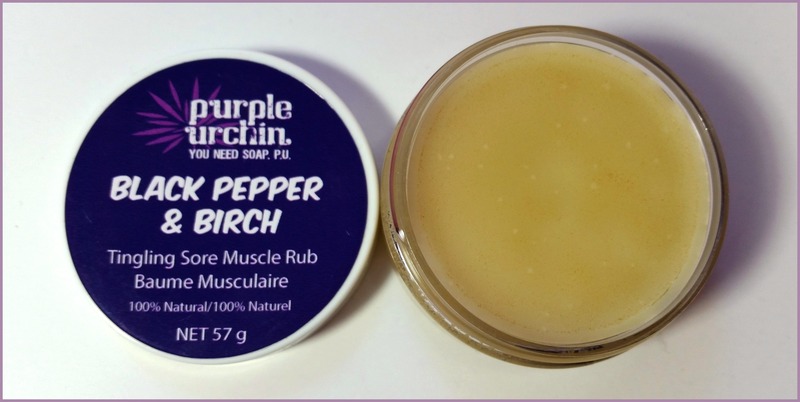 It’s similar to “Tiger Balm” in the sense that you can also apply Purple Urchin’s Black Pepper and Birch muscle rub to your forehead, for headache relief. After applying, it works fast. You feel it get into your skin, gently tingle and work its magic. You can pronounce all the healthy ingredients, including several top-shelf well-known and researched essential oils that target muscle pain. Since this muscle rub is filled with essential oils, it bears the following warning: Sweet Birch essential oil should not be used if you are pregnant, have liver problems, or are on blood thinners. Do not apply to babies or children under 12 or to open wounds. Knowing I can manage my muscle pain naturally is nothing short of satisfying. If I help only one other person manage their muscle pain, minus harmful benefits- than this article has served its purpose. I’ve always kept a close eye on this local soap making lady- surprised to say this is my first Purple Urchin review. Their clean, skincare innovations are something I’m proud to support because they’re well blended, smell great naturally, and they work. For anyone interested in using only handmade, clean, effective bath and body products- this brand is well worth checking-out. In only a few years Purple Urchin has grown immensely all via grassroots marketing. It’s the type of product you try -love, and tell your friends about. This stuff looks fantastic, wish we could get it here in SA. Thanks for linking with #ShowcaseTuesday – Have a great day ? Hi lovely, keep meaning to come visit and leave a comment. This looks awesome. I feel your pain as i have arthritis in my neck from car whiplash and also Fibromyalgia, so i’m a fan of most natural body rubs, balms & oils to help relax those tight excruciating muscles. No joke- I feel your pain. I’ve been warned about arthritis in my neck too, I broke my C2 and crushed 2 discs, I’m lucky to even be alive. I’m always trying any and everything natural too to help manage the pain, this one really helps! Thanks for reading & commenting! 🙂 Love your writings too!